The Dow Jones fluctuated over the course of the session but remained firmly in positive territory yesterday closing up 354 points at 24,640. The rebound on Wall Street came as some traders looked to pick up stocks at reduced levels on the heels of the recent weakness. The drop seen during last Friday's holiday-shortened session dragged the Dow to its lowest closing level in four months. Trading activity will be somewhat subdued today, with traders looking ahead to a meeting between President Donald Trump and Chinese President Xi Jinping later this week at the G20 summit. Reports on consumer confidence, new home sales, and personal income and spending are likely to attract attention in the coming days. The Dow finished on a bullish note yesterday, and the RSI is still looking bullish suggesting more upward movement for today's session. 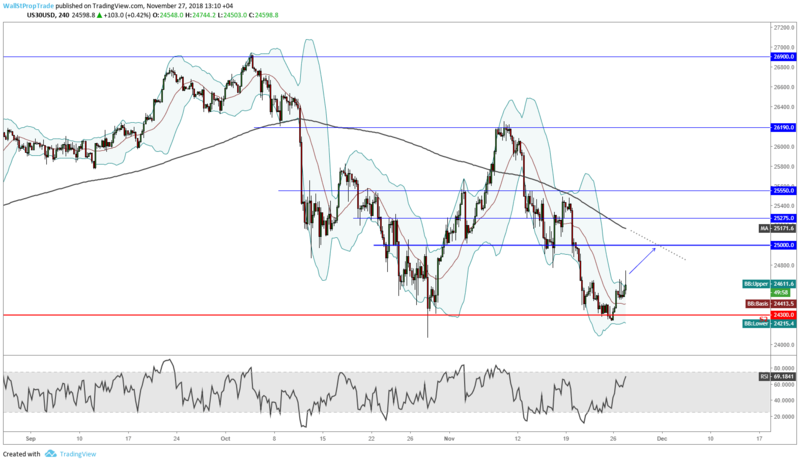 However, the index is still trading below the 200-period moving average on the 4H chart and it is highly likely that this indicator will act as resistance once prices reach that level.